Super Duper! – #DoubleFML FatDarrellPalooza! Yeah, yeah, long time readers must be shocked about the homage to Superman in those photos since Batman is my favorite superhero. But hey, it’s called diversity my friend, look it up. Anyway, hello there! Good Merrrrrrrrrnin! Hmm, I’m not sure why I went “full Madea” on you with that intro but let’s hope that never happens again, shall we?! Besides, I have no idea if you’re reading this in the morning anyway, since it’s forever archived on the interwebs. For all I know, it might be 3am in Iceland or whatever part of the world you’re in right now. 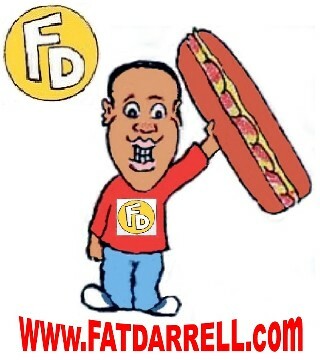 Whatever time it is wherever you are though, welcome to #DoubleFML FatDarrellPalooza! Thanks for dropping by. Speaking of Iceland, I read that the temperatures in Chicago on Wednesday were lower than Antarctica, Mount Everest and Siberia! Geez, I almost moved there instead of Atlanta back in 2012! As my dating record shows, I don’t always make the wisest decisions, but heading south instead was definitely a great one! Although Chicago seems like a great city and all, winter there is no joke! Actually, the temperatures in the entire mid-west region right now are no joke! Um, thanks for the tips. Seriously though, stay warm up there folks. It’s dangerously cold outside! Winter here in Atlanta IS a joke to an extent though. And now look at the forecast! It goes from freezing temperatures up to shorts weather all in one week! I never know how to dress down here. You can go from flip flops to snow boots in less than an hour! I should start wearing those rip-away tracksuits that NBA players have so I can switch from shorts to pants easier throughout the day. As mentioned, I hate the cold so don’t get me wrong, I’m not complaining! It is funny how crazy people get whenever anyone mentions snow down here though. That “Snowpacalypse” disaster several years ago that backed up Atlanta highways for an entire week is clearly still fresh on everyone’s mind. They’re so paranoid they might repeat that disaster that they’re overly cautious now. I swear, as soon as one snowflake falls from the sky, everyone goes into full panic mode! CLOSE ALL THE SCHOOLS! BUY ALL THE BREAD!! BUY ALL THE MILK!!! Aww, Atlanta. Bless your heart. Ha “Bless your heart.” See? I’m practicing my “southern shade throwing” since that’s not as sweet of a term as it sounds. So, if you’re new to The South and anyone ever says that to you, don’t be fooled! They’re basically calling you an idiot. Back in Jersey, we’d literally just call someone an idiot but down here, they serve sugarcoated shade. A verbal knee to the groin with a side of sweet tea if you will. Although I still prefer straightforward New York Metro communication, Atlanta may win the 2019 petty awards if this invitation I received on Facebook is an actual event. Look! Her: What are you up to? Me: I was just doing the running man in my living room to that Pepto-Bismol “nausea, heartburn, indigestion, upset stomach, diarrhea…” commercial. And THAT, my friends, is why I don’t have a girlfriend! Anyway, where was I? Oh yeah, the Super Bowl! As mentioned last post, I’m actually working with the production company for the Super Bowl halftime show this year! The show details are super top secret so I can’t take any photos inside of the rehearsals without getting a lifetime ban and sued by the NFL so um yeah, that’s not happening! A few of the senior producers have taken some photos for us though so I may have some for you once the game has been played. I can tell you that it’s one amazing show though! Maroon 5, Travis Scott, Big Boi and the entire production team have been doing an amazing job putting this together so far! The artists have also been really cool interacting with everyone and filling downtime with impromptu songs and jokes. My role is to assist moving the staging onto and off the field within the 4-6-minute window we have to get everything put together. If you remember how elaborate these sets are, it’s definitely a challenge but we’re going to make it happen! Although I’ll be one of the first and last to enter and exit the field, the odds of you spotting me are pretty slim but we’ll see how things play out. Whether you’re a big Maroon 5 fan or not, I think you’ll be impressed by the quality of the show. It’s been amazing to watch things come together. Now that I have contacts with the production company, I may start working every halftime show going forward! So Miami friends, I’ll see you next January! That’s about all I can share at this point but we’ll obviously discuss the game in more detail next post! I also had the opportunity to do a little background work for 2 Geico commercials on my “day off” from the halftime show rehearsals. Ernie Johnson from Inside the NBA starred in the first one which is funny because I just met him a few months ago at the SEC Championship game! The commercials were both filmed on a basketball court at Infinite Energy Arena. I actually think I was allowed to take photos this time but I was so paranoid from my Super Bowl training that um yeah, I’ve got nothing. Whoops! Anyway, I’ll let you know when they come out but you may not see me at all depending on how they’re edited. I was close to the action in both ads but they have so many different camera angles, I have no idea if I’ll make the final cut. Either way, it was fun, I got paid well and I ate at least $60 of food in catering so all in all, it was a great day! It was also a great day when I spotted these 2 new Oreos flavors! Behold! Oreo-oh my… Dark Chocolate and Fudge Covered Oreos! I don’t think they need much more of an introduction than that but before we move on, let’s take a closer look at that shirt eh? Anyway, let’s try these cookies! Dark Chocolate: Oh wow, first off, the cream filling is dark too! Yes, the name is literally “dark chocolate”, so I don’t know why I’m so surprised either, but it’s still a cool sight! As for the taste, they’re basically regular Oreos with a little extra cocoa flavoring! The dark chocolate taste is so subtle that I honestly didn’t notice that much of a difference. It’s no secret that regular Oreos are my fave, so when it comes to taste and appearance, I have absolutely no complaints! With that said, if they taste just like the regular Oreos anyway, you might as well just buy the original…or the hot cocoa flavor which is also similar. Once you get past the visual aesthetics, these just seem redundant in my humble opinion. But they are tasty! As you can see, they obviously don’t pack as many cookies in the fudge covered variety but hey, quality over quantity, eh? As for the taste? Oh wow, they don’t skimp on the fudge on these! It’s essentially an Oreo cookie wrapped inside of a Hershey bar. It’s great! It’s obviously sweet but if you’re eating an Oreo wrapped in fudge, I’d imagine you don’t mind sugar too much! I love the texture. They’re a nice change of pace from the traditional blend. Nabisco also rolled out fudge covered Ritz Crackers and Nutter Butter cookies too! I’ll have to try those next! Hmm, I’d better buy more milk…if any is left after the “snow storm” we had on Monday. Do you have another food item, restaurant or recipe we should all try? Tell us about it in the comments below! It’s always a sharp turn dropping a fitness tip right after a crazy food item but that’s what we do here. Again, it’s called diversity folks! Besides, the wild foods are only for cheat days. The rest of the week, you need to eat right and workout if you want any shot at hitting those New Year resolutions! If you’re in one of the cold weather states but prefer outdoor workouts, make sure to check to make sure the air quality is safe. As mentioned earlier, it’s literally dangerous to breath outside in the mid-west right now. If the air quality is okay, you’ll still want to layer up so you can ad or decrease layers are your body heat rises and dips. You’ll also want to be able to cover up quickly once you stop since you’re likely to be covered in sweat. Although you may not feel like it, you’ll still need to drink plenty of water to stay hydrated. Also make sure to check your surroundings and shoes so that you don’t slip on black ice or falling debris. Your muscles may not be as flexible in colder temperatures. You’re also likely to feel more pain in your joints than usual so make sure to warm up and cool down properly to avoid injuring yourself. Those are a few simple ideas to keep your outdoor workouts running strong! Do you have another fitness question, goal or accomplishment you’d like to share? Tell us in the comments below! Just typing that last paragraph made me cold so it’s time to make some hot chocolate and destroy a sleeve of Oreos! DJ, cue the music! Before we go, let’s check out the “Foodie Holidays” that happen between this and next post! Unfortunately the carrot cake Oreos I tried a few weeks ago are long gone for the 3rd though. Ha, tater tots too?! This is a pretty good week. I’ve never had a cake pop before but they seem like a tease. Give me the whole cake, pops! I’ll have to ad them to the list of things to try though. Perhaps I’m missing something. My friend Myra also shamed me because I’ve only been to Waffle House once in my entire life and never had their cheesy grits. Looks like I’ll have to try that too. Sorry for the late release for this post. My schedule has been crazy with rehearsals so as we announced a few weeks ago, the best way to know when we post new content is to sign up for our mailing list on the main menu. You can also click the social media icons there to follow me there as well! Oh yeah, and my song Ready that I created for The Atlanta Hawks is now live on all digital music platforms so stream it, download it and all that good stuff! Here’s the link to check it out on Amazon but it’s also on Spotify, iTunes and more! Okay folks, that about does it for this week. I’ve got to shower and then fight traffic to get to my next rehearsal. Before you go, please drop a comment below though! I love hearing from you so please, don’t be shy! Thanks again for dropping by. I appreciate each and everyone of you. I hope your week is amazing and filled with love, peace and tacos! Let’s get it! Sounds like I’m going have to do some baking and send you some cake pops and cheesecake pops mmm mmmm mmm so good! So excited for your upcoming rolls and to keep a look out for you at the super bowel! Wow, okay cheesecake pops do sound good! I’m just thinking I’d need about 10 of them before I’d start to feel satisfied! Thanks for the support on the projects, I appreciate that! Thank you for downloading the song! I hope you enjoy it! Words for all “drama queens”are on your t-shirt…”Save the Drama for your Mama.” Where in the world did you get that Tee? Some ladies I know better heed these words!!! LOL. Those oreos look tasty, and I must try the fudge covered ones. While I’m watching the Super Bowl halftime show this year, I will be thinking of you, knowing that you will be Enjoying yourself!!!! Ha, yeah, I don’t have time for drama. I’m way too busy for all of that! The fudge Oreos are great yes, they’re definitely worth a try! I can’t believe that you found time to publish such an interesting post with all that is going on with you right nowt!!! Great opportunity for you with the Geico commercial! Glad you had fun. I know that Atlanta is really ” Hot”, right now with all of those extra people in the area. What a “Wow moment.” Anyway. Have fun. Love all of the “Foodie Holidays” for the week. Next time we hear from you it will be post Super Bowl. Looking forward to that post!!! It’s not HOT in Atlanta yet – it’s still pretty cold out there but I can’t complain since Chicago’s weather puts everything in perspective! And yes, stay tuned! I’ll post more about the big game next week! Oh yeah, I’m really enjoying your song “Ready” and encouraging others to download it!!! Good job!! !